Get professional Opinion and Treatment about your Labral Tear. Non invasive treatment by Experienced Shoulder Specialist. Call us +65 97731458 to schedule for an appointment. The labrum is made of a thick tissue that is susceptible to injury with trauma to the shoulder joint. When a patient sustains a shoulder injury, it is possible that the patient has a labral tear. The labrum also becomes more brittle with age, and can fray and tear as part of the aging process. In addition, some types of labral tears, specifically a Bankart lesion, can increase the potential for shoulder dislocations. 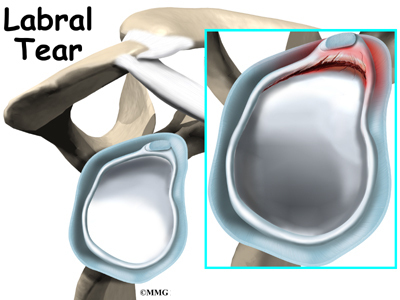 What are the common types of labral tears? A SLAP tear is a type of labral tear most commonly seen in overhead throwing athletes such as baseball players and tennis players. The torn labrum seen in a SLAP tear is at the top of the shoulder socket where the biceps tendon attaches to the shoulder. A Bankart lesion is a labral tear that occurs when a shoulder dislocates. When the shoulder comes out of joint, the labrum is torn, and makes the shoulder more susceptible to future dislocations. Posterior labral tears are less common, but sometimes seen in athletes in a condition called internal impingement. In this syndrome, the rotator cuff and labrum are pinched together in the back of the shoulder. What is the treatment for a torn labrum? The treatment of a torn labrum depends on the type of tear that has occurred. Most labral tears do not require surgery; however, in patients who have persistent symptoms despite more conservative treatments, surgery may be necessary. Posted in Shoulder Pain and tagged labral tear, labrum tear, labrum tear treatment, shoulder dislocation, shoulder pain clinic, shoulder pain specialist, shoulder surgeon, singapore shoulder specialist.